BOISE – Though he didn’t get much attention entering the season, Diosbel Arias has quietly put together a remarkable season for the Spokane Indians. 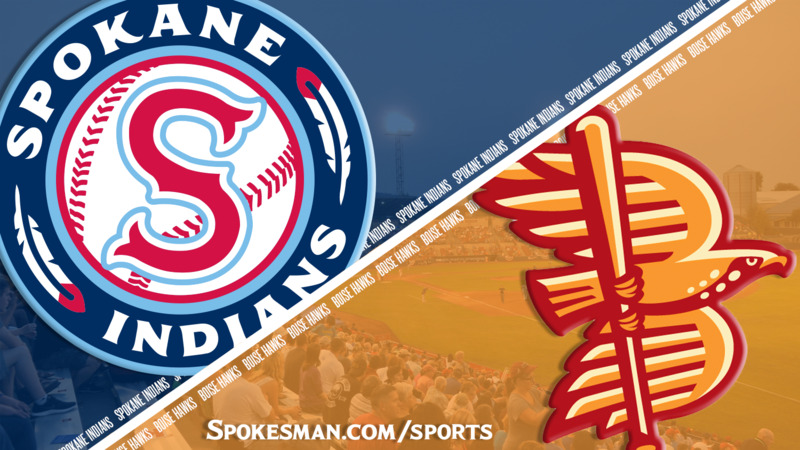 On Monday against Boise, Arias continued his quality season, going 4 for 4 with two walks and the Spokane Indians beat the Boise Hawks 6-3 in 10 innings in the finale of a five-game Northwest League series. The Indians (10-8) host the Everett AquaSox, the NWL affiliate of the Seattle Mariners, in a three-game series starting Tuesday. With Troy Dixon at second as free runner in the 10th inning, Tyler Depreta-Johnson looped one down the right field line that just stayed fair for a double and Dixon chugged home with the go-ahead run. With one down, Jonah McReynolds reached on an error and Curtis Terry’s soft liner the other way plated Depreta-Johnson to make it 5-3. Arias went 11 for 21 in the series, while Troy Dixon and Tyler Depreta-Johnson had three hits apiece in the game. Arias raised his average to .361, leads the league in on-base percentage and has three homers with 31 RBIs. He has played second, short and third base for the Indians and started at third in the NWL-Pioneer League All-Star game last week, where he went 2 for 3 with a run out of the leadoff spot. Arias signed with the Texas Rangers organization last July and spent the rest of the summer of 2017 with their rookie-lever Dominican League team, where he hit .419/.438/.548 in 31 games. All he’s done in Spokane is continue to hit. Rangers assistant director for player development Paul Kruger said the organization has been impressed with Arias’ progress. “I think the strides that he’s made, the strength, his ability to move around in the infield, and his strike zone awareness has been something that really been – surprise isn’t the right word – a pleasant success story in his first season coming to a new culture in a new country,” Kruger said. Arias led off the second with a single and went to third on a single by Kenny Mendoza and scored on a groundout. Back-to-back singles by Isaias Quiroz and Dixon brought in another run. In the bottom half, doubles by Willie MacIver and Hidekel Gonzalez netted Boise a run to cut its deficit to 2-1. With one down in the fifth, Arias lashed his third single of the game and stole second. Austin O’Banion ripped a sinking liner to center, but Luke Morgan made a diving catch to prevent a run from scoring. Boise (6-11) took the lead in the sixth on four straight singles, which ended starter Jake Latz’ night. He went 5 2/3 innings and allowed three runs on eight hits and no walks with two strikeouts. Depreta-Johnson singled to lead off the eighth and Starling Joseph – who was hitless in four trips to that point – doubled to center to tie the game. With two down the Hawks walked Arias intentionally but Mendoza tapped back to the pitcher for the last out of the inning. Published: Aug. 13, 2018, 9:41 p.m. Updated: Aug. 13, 2018, 9:48 p.m.